This picture shows the longer ~15 meter trackway on Valentia island. The numerous ripple marks are clearly visible in this image. Sitting at the southwest tip of Ireland, off the beaten path, is the very beautiful island of Valentia. It's off the tourist route, so there are no tour busses or tour groups. With only a few small roads and two small towns, it is still one of the hidden gems of Ireland. It is also a hidden gem of paleontology. On a tiny stretch of rocky beach on this island rests numerous little depressions. They are hard to see in the wrong lighting, but near sunset and sunrise when shadows are cast, these little depressions become visible. Most people don't bother to look at them. In fact, many people who come here and view them are disappointed. I overheard a few people say "It's just a rock," or "Those don't look like foot prints." or "They are fake." However, to a paleontology minded person, these little depressions are some of the most important fossils on Earth! 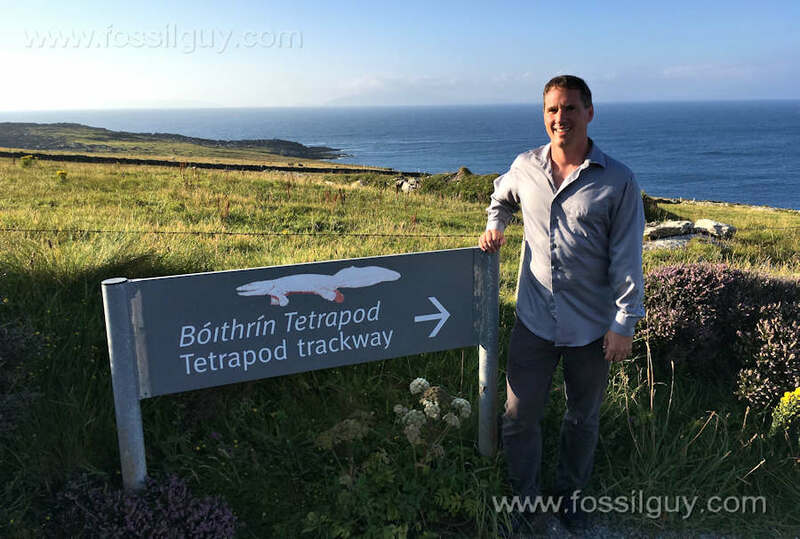 This picture shows another set of tracks at the trackway on Valentia Island, Ireland. One can see fainter tracks to the right of the mian trackway. These little depressions make up the Valentia trackway of the Devonian time period. 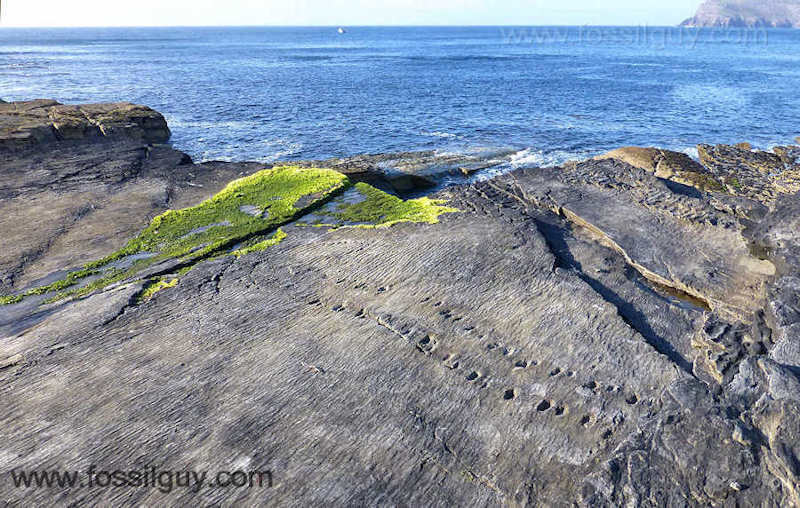 This is one of the oldest and longest tetrapod trackways on Earth! These trace fossils showcase a turning point in evolution; they are the oldest evidence of a walking animal. These fossils beckon a time where animals were first starting to advance onto land. 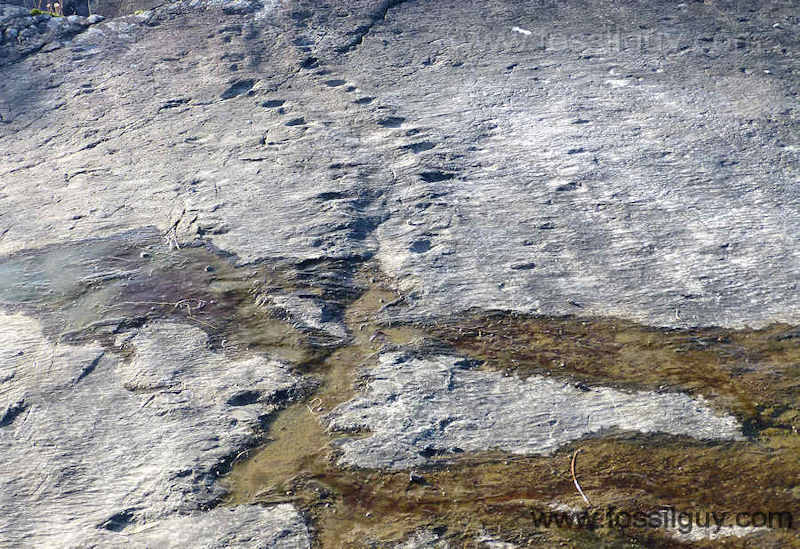 This unique trackway contains the longest tracks out of any early tetrapod trackway ever discovered. The tracks are found on a ripple marked bed that was deposited on mud during a flooding event. Paleontologists think the tracks were either formed from a tetrapod (four legged animal) walking either in very shallow water or on the freshly exposed mud. There are at least five separate tracks found here, with the longest at an astounding 15 meters in length, by far the longest early trackway on Earth. These tracks show overlapping pairs of foot impressions with occasional tail or body drag marks. Based on the footprint size and spacing, the tetrapod that made these is thought to be around 1 meter in size. These tracks were discovered in the early 1990's in the Valentia Slate formation by a Swiss graduate student, Iwan Stossel. After intense study, the age of these trackways is concluded to be somewhere from the Givetian to the Frasnian stages of the Devonian (about 383 - 388 million years old), making these some of the oldest tetrapod trackways on earth! 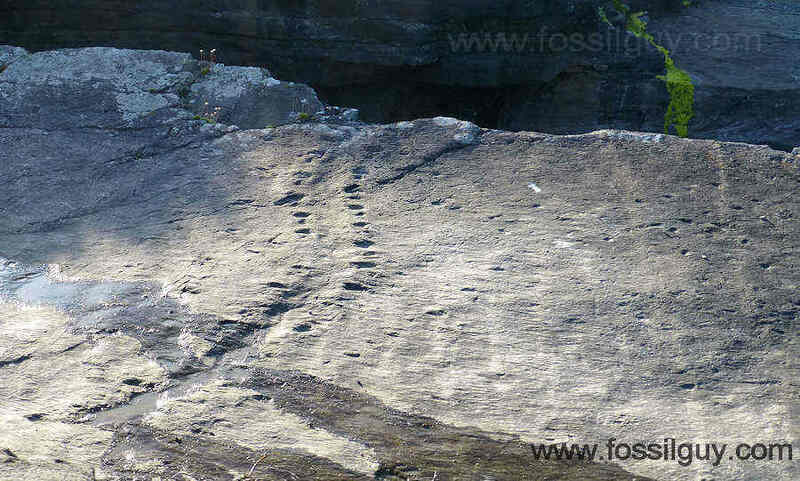 There are a total of four early tetrapod trackways that have been discovered. Along with the Valentia trackway, there are the Tarbat Ness trackway found in nearby Scotland, and also the Genoa River and Glen Isla trackways found in Australia. Most are much shorter and not as well preserved as the Valentia trackway. Here is a brief description of the other three. This is a very short trackway that contains a set of complete prints, and a small fragment of another track. This trackway is unique in that there are rain drop marks in the rock, meaning the tracks were made above the water. The age is somewhere between the Givetian (Devonian) and the Tournasian (carboniferous) stages (388 - 346 million years old). There are at least two trackways near each other on the Genoa River beds in New South Wales, Australia. They are probably Famenian in age, which is Late Devonian, about 359 - 372 million years old. The first trackway is 1.1 meters long and has well preserved foot impressions. The second trackway is smaller, less preserved, and shows belly or tail drag marks. This trackway was discovered in Victoria, Australia. Unfortunately, it was found on a large paving stone, so the specimen's exact origin and age are difficult to determine. The sandstone it is found on has ripple marks. The trackway itself on the stone is 1.5 meters long and has no tail or belly drag marks. One of the most important times in vertebrate evolution, the transition from sea to land, is nearly impossible to fathom. The vastness of geologic time is simply too great. However, seeing an actual trackway that is over 300 million years old, makes this intangible period as concrete as footprints in stone. If, by some chance, you find yourself on the beautiful island of Valentia, the trackway is not difficult to find. Head toward Chapeltown in the middle of the island. Once there, take the road heading north (Geokaun View). Continue following this road toward the Lighthouse and Radio Station. Eventually, the road will split. Stay toward the Radio Station. Just before the radio station, you will see an out of place sign that reads: "Tetrapod Car Park." Park there and walk down the hill toward the rocky beach, hike down the hill, and into the past. There are interpretive signs at the trackway. The trackway itself is roped off (to prevent erosion from people walking on it), but you can see it all from behind the ropes. Please stay off the trackway. This picture shows the numerous ripple marks perserved on the trackway bed. 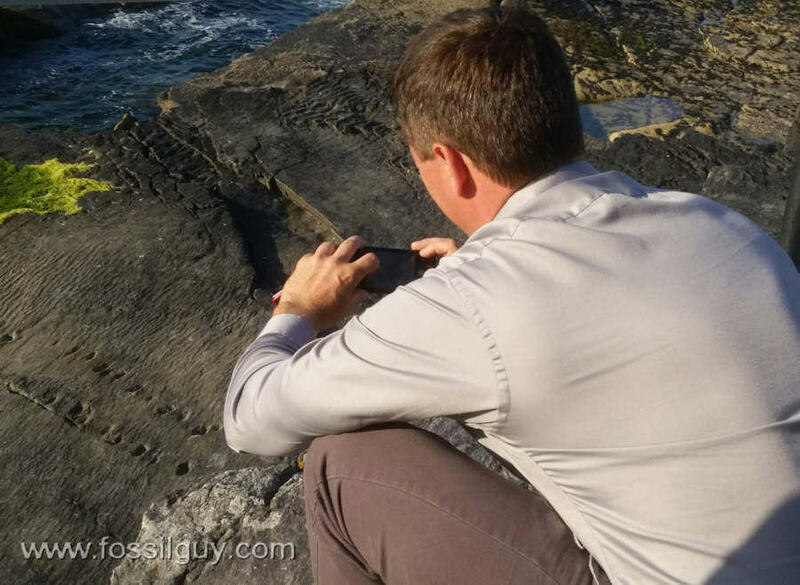 The Author taking a photo of the Tetrapod Trackway. On a side note, if you are hiking on Valentia, or anywhere in Ireland, don't fall in the old Ha-ha walls! You can break a leg! 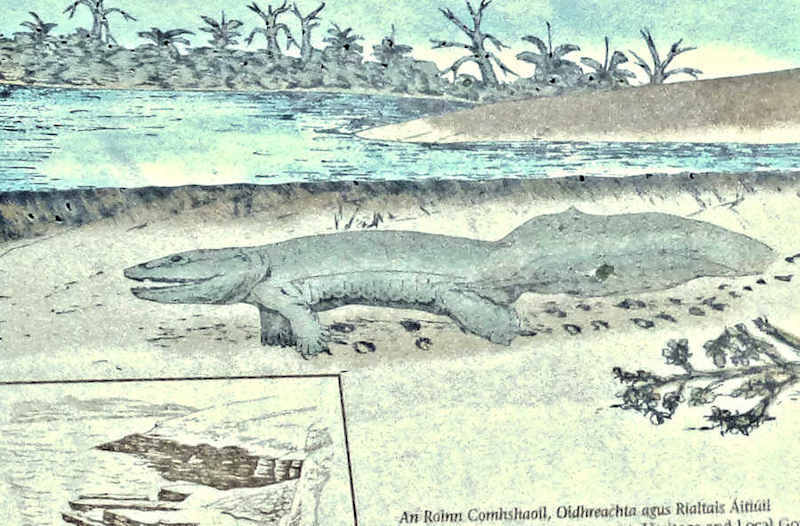 This book, full of comparative illustrations and photos, tells the story of tetrapod evolution, how it started 370 some million years ago, and goes through the different interpretations of the various early tetrapods. It is a must for anyone interested in Tetrapod evolution. A gread guide for hiking around Killarney and Velentia, Ireland.